In Italy, just before sunset on the Manarola coast, Tom and I met a young American woman on her honeymoon. We had just finished our first mediocre Italian dinner at an American-filled tourist trap in town and wanted to catch the sunset. The cliffside path that led from Manarola to Corniglia had been congested with tourists when we first arrived. Now, the crowds had lessened somewhat, but at one particular point there was a dense cluster of people of various nationalities, each holding a fancy professional grade camera or smartphone, or both, many of the latter mounted on selfie sticks. Everyone glanced back and forth between the faded pastel colored buildings clustered atop the hills of the fishing town and the glittering horizon. Rather than enjoying the view, they all appeared to be waiting for something. “What’s everyone waiting for?” I asked no one in particular. I turned to see a young woman with caramel colored hair and a paisley scarf tied loosely around her neck. She was also holding a camera – a new, slick-looking Sony model. She had bright eyes and a friendly smile. There was some pesto in her teeth. Where were we from, she asked, her voice now tinged with a mothering note, as though since she had been there before she was obligated, in a way, to give us some sort of guidance. New York, we said, to make things easy. And herself? We nodded. We didn’t know, but now we did. “I’m actually on my honeymoon,” she said. “Thanks,” she said, and to answer our next question, she looked past us to a sullen looking young man leaning against the railing, staring at the water. From where he stood, the town wasn’t visible, only the ocean. He was just a few feet away, within earshot but had said nothing the whole time and gave no indication that he would come join the conversation. She smiled at him then slightly apologetic, back at us. He had never been anywhere outside the U.S., she explained, until after college when they went to Mexico and stayed at a seaside resort. I laughed and thought about just a few hours ago when we checked into our simple studio in the hills of Manarola. A lucky last minute find as it seemed the rest of the accommodations in Cinque Terre, whose popularity as a destination seems to have increased tenfold thanks to social media, were sold out. “This reminds me of Mexico,” I had said to Tom. The bare, damp smelling stone and plaster walls and the small simple kitchen and bathroom with the slow drains brought back memories of my simple room in Playa del Carmen, in which I lived for three months during my own college study abroad. Later the vicious mosquitos of Cinque Terre would further remind me of Mexico. This wasn’t her first time in Cinque Terre? I was still, as I do in the first few days of arriving in any new place, gauging if I could see myself coming back. “Oh no I’ve been here before,” she said, as though it were obvious. And hesitated a millisecond while reading our faces, checking to see if she ought to continue. We were in a receptive mood and without meaning to, had called upon her expertise. She had studied abroad in college, see. And long before that, her mother, a product of an international school in Brussels, had made sure that once her daughter was old enough to appreciate it, would see and know the things that were central to her character. When she was a teenager her mother took her to Italy and she fell in love with the place the way impressionable young American women from boring small towns usually do: Italy, she was taught, was the birthplace of culture. The spaghetti and pizza and ice cream she loved to eat at home were a thousand times better in Rome and Florence. The men seemed more charismatic, the women more sophisticated but friendlier and less aloof, unlike the French. The small shops that lined the streets seemed to contain much more interesting things than those back home – the whole thing seemed like the movies! Except it was real. In college, she returned to study abroad. She had her first glass of wine, then her first bottle. Probably kissed her first Italian boy, a lean, evenly browned boy named Leo or Gianni with sun-bleached hair and no career prospects outside of tourism (he was now probably a disgruntled waiter in that touristy restaurant). She learned how to order and drink an espresso without grimacing. She practiced wearing her hair loose and struggled to achieve the perfect tan, getting frecklier instead. She got some of if right, except she lacked the passionate self-possession she sensed but could not perfect. And she visited Cinque Terre. To this day, it remained her favorite place in “the whole, whole world,” and on their honeymoon, she wanted her less well-traveled husband to see it too. She looked over at her husband again, who had not moved. I wondered if he was tired or angry or disappointed. From where I stood it appeared to be a bit of all three. “Is Cinque Terre your guys’ last stop?” Tom asked. We chatted a bit more until she remembered why she was standing there during that time of day. She turned towards the sun, which was shy and remained behind a thick curtain of clouds. We nodded, looking sufficiently wistful. If catching the view also meant being jostled while listening to a greedy flurry of clicks, I wanted to explore other ways to enjoy the sunset. I had my camera and my phone with me, but had not brought them out during our conversation. And even though I would take (and post) the same shots around the same time of day as everyone else, it was suddenly off-putting to me to do it at that moment, when so many people were already waiting to do the same. A few minutes later Tom and I walked back towards town and I snapped the photo above, the golden hour passed but the view no less beautiful. “She was nice,” I said. I laughed. Even more than her antisocial husband, the woman had bothered us because of her smugness, veiled by an eagerness to share what she knew. Also, she had been not at all curious about us. That was her greatest offense. We considered ourselves to be not just well travelled but also cultured. Couldn’t she see the culture that was written over our faces, in the way we carried ourselves? Couldn’t she sense that between the two of us there were five passports, at least four ethnic bloodlines and just two! Two continents untouched! Which might as well be one because, despite the tight knit community of penguins, who the hell counts Antarctica? Wouldn’t she have been interested to know that Tom had grown up in Japan, had gone to international school and that I had practically spent half my life in Taiwan and was fluent in Mandarin and that we had met and now lived in New York, the greatest melting pot of all melting pots to where people from Peoria fled if they had any sense? Wouldn’t she have been interested to know that I wrote a blog about – among other things – this very thing? 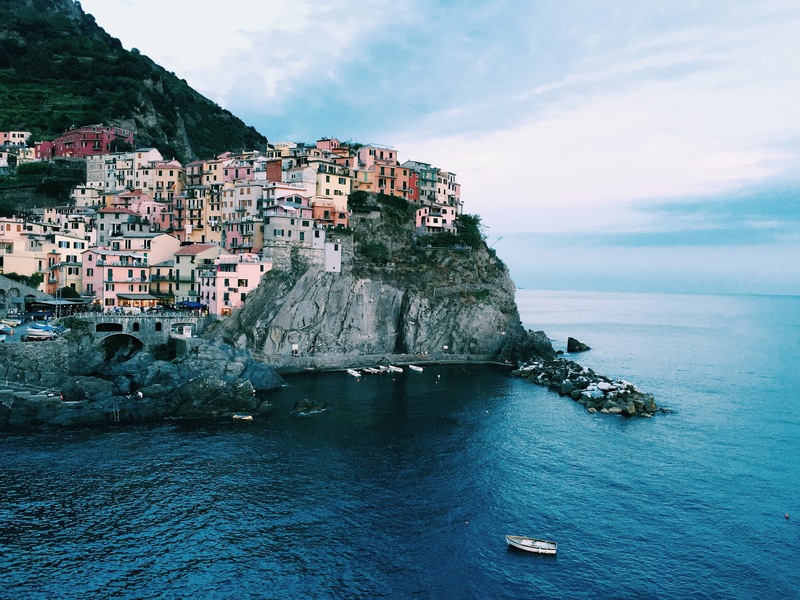 And that above all, this short, tiny little jaunt to Cinque Terre, which apparently for her embodied the pinnacle of culture, was for us just one of hundreds of points on the map of our well travelled lives? No, because she didn’t ask. And she did not give us the chance to tell her. “I would never honeymoon here,” I said, huffing up the hill. “I hate people like that,” said Tom, thinking, probably of where he might find a hamburger, so disappointing had been his seafood ravioli. And us two Americans tourists having satisfactorily expressed our disdain for two other American tourists, walked off, the missing Italian sunset at our backs.